alaTest has collected and analyzed 779 reviews of Samsung Galaxy View. The average rating for this product is 4.6/5, compared to an average rating of 4.3/5 for other products in the same category for all reviews. People are impressed by the size and usability. The portability and durability also get good feedback. There are some mixed reviews about the storage and reliability. 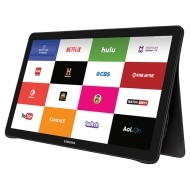 alaTest has collected and analyzed 128 user reviews of Samsung Galaxy View from Amazon.com. The average user rating for this product is 4.5/5, compared to an average user rating of 4.1/5 for other products in the same category on Amazon.com. People really like the price and performance. The size and screen also get good feedback, but some have doubts about the storage and portability. Leaked images of the rumored 18.4-inch tablet shows a sleek, enormous slate made with some practical design elements. The Samsung Galaxy View is the biggest Android device ever, but what's it for?